Today my fellow Trendy Twine DT sisters and I are surprising Lesley with birthday cards that we created for her. Happy Birthday Lesley!! Stop by the Trendy Twine blog to see ALL of the cards we made for her. For my card, I used a pumpkin cupcake file from Miss Kate Cuttables. What is a birthday without some cake, right?! 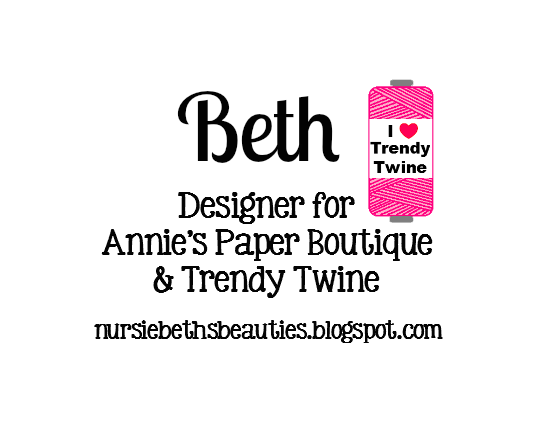 I wrapped Spiced Pumpkin Trendy Twine and Totally Chocolate Trendy Twine around the cupcake wrapper and added a double bow as well. The sentiment is from My Craft Spot's Tiny Tags set. The patterned papers I used are from DCWV's Heirloom stack. Doesn't that little pumpkin on top look so cute? This card is so amazing and YUMMY too! Your design and details are always perfect. This is such a FABULOUS birthday card Beth!!!! Awesome job! I know Lesley is going to LOVE this!!! 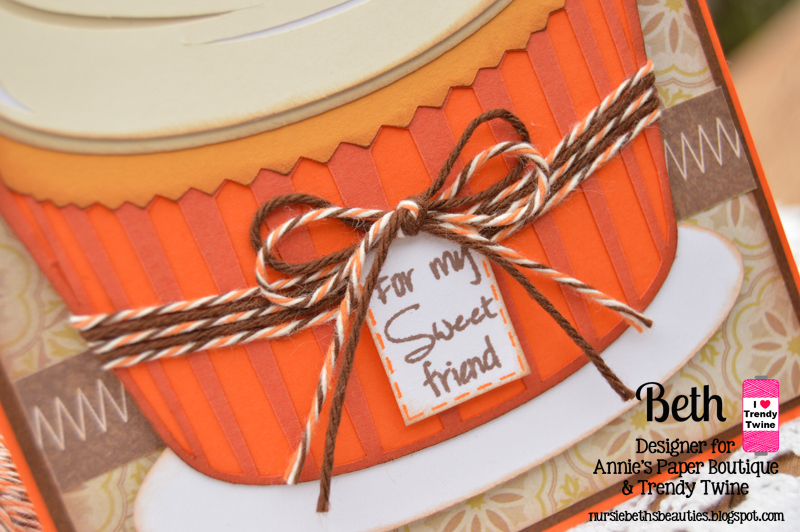 I am a huge cupcake fan..lol.. so I absolutely LOVE this card!! A fabulous & fun card amy friend!!! Lelsey will LOVE this card!! That cupcake looks good enough to eat! It is so pretty! I just love your card and know Lesley will too! Awesome card! Super cute! Thank you for playing along in the Word Art Wednesday Challenge! Have a blessed day! 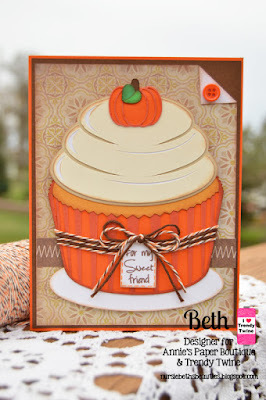 Adorable card, love the twine accent and pumpkin on top.Thanks for playing along over at DL.ART! Beth, this is a yummy cupcake!! Thanks for linking up over at PDE Linky Party. Beth, thank you so much for my wonderful birthday surprise. You definitely caught me off guard. 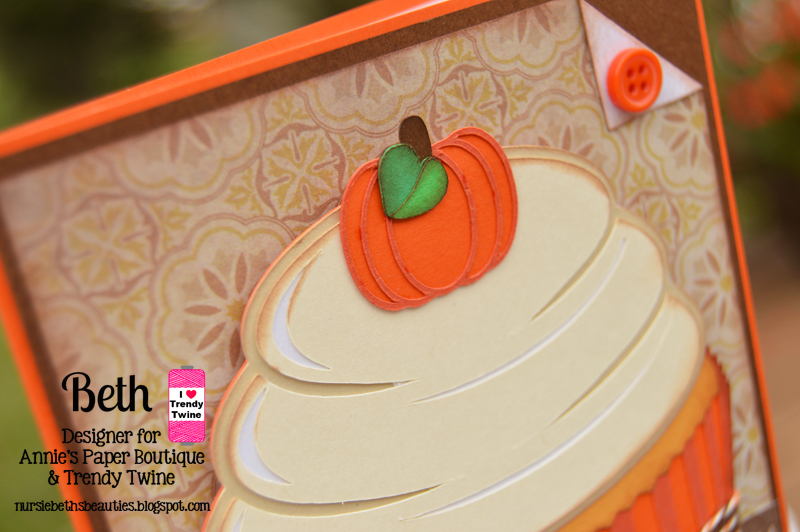 I just love my cupcake card. And the fall colors, too -- perfect. Thanks for my gifts. They are perfect. What a fun and yummy card! Lovely design! Thank you for joining us at TTCRD this week! This card is so creative! Thank you for playing along with this month's issue over on the Paper Issues blog!